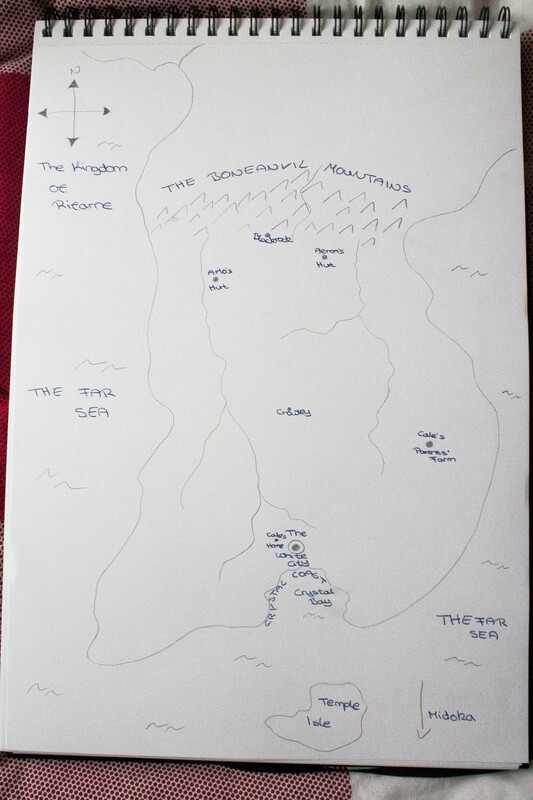 If you’re writing a fantasy novel then a map depicting your world is a must – both for you and your reader – but if you’ve never done this before you might not be sure where to start. When I first contacted MonkeyBlood Design to work on my map I had no idea what I was doing, or whether my terrible sketch would even be good enough for them to work with! Turns out, they don’t even always get a sketch (and more power to all cartographers for working with nothing but a description!). 1) They’ve seen everything, from an already beautifully drawn map to a brief description of the world/ country/ dungeon/ city/ whatever you need, so chances are your rough sketch is good enough as well. Don’t worry if it isn’t perfect – hey, at least you’ve got a sketch! This was the sketch I sent to MonkeyBlood Design – not very detailed and only including the essentials, plus a description of where forests or farmlands would be. 2) Google Maps is your friend. Some people like to take inspiration from our planet, and begin by copying the outline of a country they particularly like, or that they think roughly matches their country’s outline and then they change it up from there. More than that, it’s a great source for distances! It can be difficult to know the distance between two places you made up, or how long it would take to travel there (don’t forget that you probably have more than two places and it eventually gets complicated). Find two places on Google Maps which are as far away from each other as you want yours to be. Google Maps can tell you the distance in miles, as well as how long it would take to travel there on foot, by car, by train, by bike and by plane! It’ll give you a better idea, and it’ll help the cartographer scale the map. GoogleMaps can tell you how long it takes to walk somewhere – massively useful when planning journeys in your novel! 3) Be flexible and expect some changes. If your mountain range is geographically impossible, it’s geographically impossible. Unless you’re okay with people not believing you, that’s something to avoid. If you’re writing a fantasy novel than you might be able to explain impossible features (like upwards flowing rivers or floating hills) with magic, but I wouldn’t recommend you do it all the time. No matter how fantastical your world is, it needs to be believable or your readers will have a hard time following you. 4) You don’t need to name every town, farming community, city, river and mountain. It’ll only get confusing for your readers if you do, and it’ll offer too much information. When I read a book and use the map for reference I don’t want to have to spend ages trying to figure out where Jaqueline is right now. Name the important places your characters go to, even if that means only naming two towns, one hut by a river and a cave. Your readers will guess that there are other places in your world, too, so don’t worry about your map looking empty. Likewise it might be tempting to include a full world map in your first book, even though your character doesn’t leave the county once. Again, you don’t want to overwhelm your reader. Show them the part that’s important, and keep the rest for later. 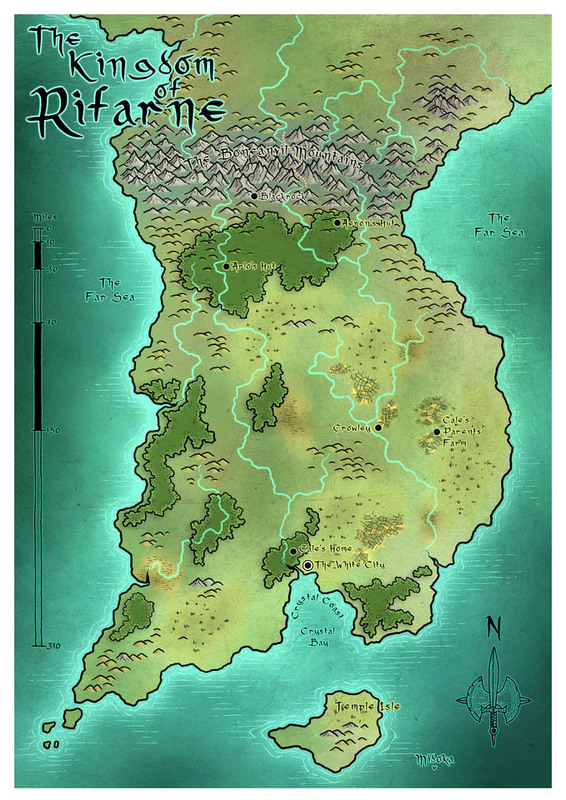 For example, Rifarne is a small part of a much bigger map. If I were to include the whole world map in the first book you’d have a hard time making out the few places that are important for Rise of the Sparrows. 5) Colour looks amazing, and you want one. I understand. I did treat myself to a colour version of Rifarne, after all, but colour maps tend to be more expensive. If you’re on a budget you can save a lot of money by only ordering a B&W version, although of course costs vary depending on who you work with. Monochrome is likely all you need for your novel – most fantasy books don’t include a full colour version – so it’s not necessary to go all out. I don’t know, I love them both. Are you a cartographer and would like to add something? Have you worked with one before and have learned something valuable? Are you new to all this and have some questions not answered above? Please leave a comment below. … a map, I always think, “Oh good, the author’s thought this through and knows what they’re doing.” I relax because I assume I’m in safe hands. Your maps are lovely! I agree, I love finding maps in books. It’s such a great addition. The book I’m reading right now introduced this huge no region, but doesn’t have a map and I’m a little lost here and there. Wow, this is very interesting. I’ve never written a story that required a map but this is fantastic information in case it ever does happen. Hi, there I’m a geography and GIS (geographic information systems) student and I love making imaginary maps (check my twitter pictures). I think you’re maps look great! Would love to see a small lake or two. 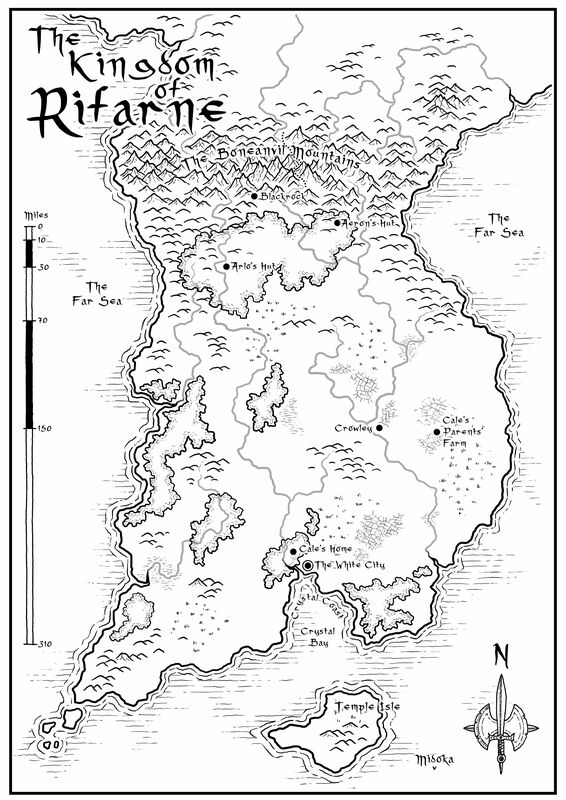 Hi there, I think maps are a wonderful element in fantasy novels, as they really help visualize where everything is taking place. What is the primary reason that you want to include a map for your work? No problem, and other than maps are there any other elements that you find useful to become fully immersed within a fantasy world? That’s a really interesting question, I’ll have to think about that properly! One thing I love more than maps is a rich, detailed history. We have history so it only makes sense that a fictional world has one, too. Even if some aspects never get mentioned, the story is still going to feel richer and better throught through if there’s a background to go with everything. Books that start at the beginning of the story but don’t seem to have anything in their history before that moment are very unrealistic I think. That’s why I love prequels, they are proof that the world existed before the story starts. What elements do you believe are useful when creating a fantasy world? I think that having full history is a fantastic element for a fantasy world. I prefer to see new things when I read fantasy so I always like it when authors deviate from the standard elf, dwarf, etc… cast of races. I also think an interesting take on magic can really make a fantasy world stand out.